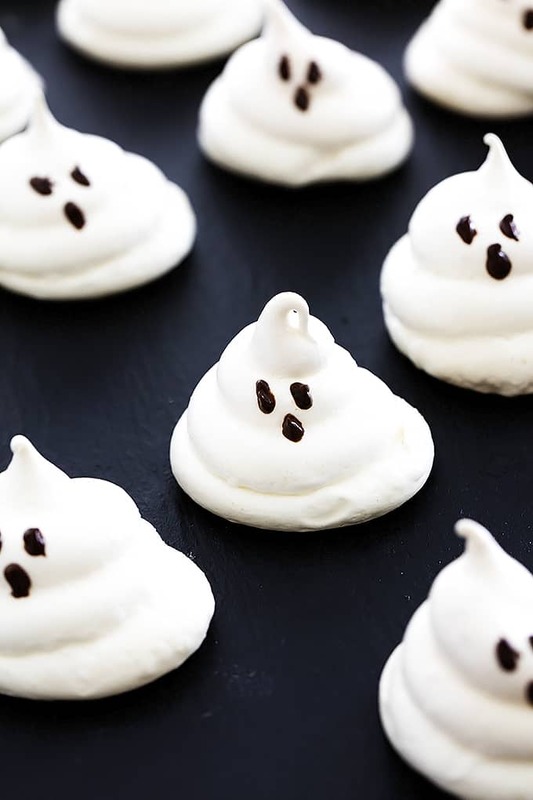 Light and airy almond meringue cookies with a bit of Halloween flair! So easy to make and fun to eat! Preheat oven to 225 degrees. Line 2 large baking sheets with parchment paper. Combine egg whites and cream of tartar in a large bowl, beat with a mixer on medium speed until soft peaks form. Increase speed to high, and gradually add granulated sugar and then powdered sugar, 1 tablespoon at a time, beating until stiff peaks form. Add vanilla and almond extract and mix until incorporated. Transfer batter into a pastry bag fitted with a large round tip. (You can use a zip lock bag with the corner snipped off if you don't have the pastry bag and tip!) Pipe mounds onto prepared baking sheets, swirling as you pipe to form the ghost shape. Bake at 225º for 1 1/2 hours. Turn oven off; cool meringues in closed oven 1 1/2 hours or until dry. Carefully remove the meringues from paper. Place chocolate chips in a small plastic bag (like a sandwich-size ziplock bag) and microwave on half power for 2 minutes until melted. Snip off a tiny corner from the bag and squeeze out just enough chocolate to dab eyes and mouths onto each meringue. Allow to cool for 5 minutes.